The record is made up of 1 b&w silver gelatin Principal photographic process for black & white photography from the 1870s. print. It was created in 20 Nov 1903. It was written in English. The original is part of the British Library: Visual Arts. View from on board ship, looking towards the Khor Kawi Passage [Khor Kuwai/Quwai Strait], between Goat island [Jazirat al Ghanam] and Telegraph island (which is part of the Musandam Peninsula). The wake of the steamer can be seen extending from the foreground into the distant background where another ship can be seen. 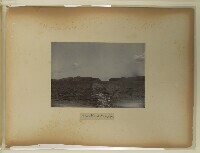 Dane Collection: &apos;Photographs of Lord Curzon&apos;s tour in the Persian Gulf, November, 1903&apos;. Silver gelatin Principal photographic process for black & white photography from the 1870s.